It is one of the many mythological shows that aired on first Indian national television channel. 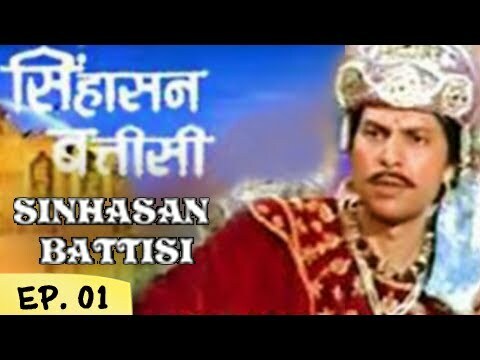 The show was an adaptation of a mythological story called Singhasan (throne) Battisi (thirty-two). The book was published a long time back. It was about a King from 11st century and a throne that has 32 models around it. The show was released in mid 80s. At that point of time Ramayan and Mahabharat were the two mythological stories that were highly in demand. By mythological show people used to think about these shows only. In the mid of 80s when Doordarshan came up with this show it was quite a refreshing and also loved by the audience. The show was based on a throne that belonged to King Vikramaditya. The throne had 32 statues of Apsara around it. It was believed that the Apsaras turned in to stone after a curse. The story was engaging and enjoyable as well. It had a social message as well. So the show had become one of the favourite shows of the nation. The story was based on a village where there was a King namely Raja Bhoj. The king was not as good as a judge and failed to solve other’s problems in the village. On the other, a group of kids were playing together when something happened between them and they started arguing with each other. The kids were not listening to anyone and kept arguing on a silly thing. After a long time when they could not reach to any solution they called for another kid who was their friend. He came and tried to solve the problem between two kids. He sat on a mound and kept listening to everyone. He solved the problem immediately after listening to them. Everyone got happy. After that another group of boys who had rift among them reached to the boy and asked for judgement. He again went to that mound, sat on it and gave a proper solution to the never-ending problem. He kept doing that, he kept solving problems of the people of that village while sitting on the mound. One day King Bhoj came to know about the kid and went to meet him. He went to the mound as well. King realised that whenever he sat on the mound he gave best solution. King asked his fellows to dig the mound and search if there was anything under that. They found a throne with 32 apsaras from the underground. King got happy, he thought he would do better judgement if he sat on the throne. Once he sat on it, one of the 32 Apsaras came alive and told him that he cannot be a good judge as he didn’t have any quality of being a good judge. Each one of the Apsaras appeared and told him stories one after another about good quality. Then the King realised that he did not deserve to seat on the throne. The qualities he lacked were honesty, unbiased, selfless and good qualities for being a judge. The King realised his mistakes at the end of the story. The show is relevant in all time. It depicted that it is not easy to become a head or a ruler. Though, in the story, the king was the ruler of the village, but the little kid made much better judge than the King himself. The reason behind this was demonstrated by the Apsaras who told the stories of being a good judge. If we look at the present situation there are many a people who hold a higher position but due to biasness, selfishness they fail to make right decisions or unbiased judgements. The show clearly tells us, even after so many years that we must know our values and worth before heading to any position. Sitting on the throne cannot make you King, you have to have the qualities to become one. Banner (production house) Mittal and Pvt. Ltd.